The fastest way to email a picture to someone in Mac OS X is also one of the easiest, and it should be very familiar to most Mac users in that it’s action is remarkably simple. The trick? Simply locate the image in the Finder, then grab the picture you want to send off through email, and drag it onto the Mail application icon in the Dock of OS X. Mail will then open with a new message created that includes the photo in the body of the mail message. Now you just need to fill in who you want to send it to, give it a subject, and send it away! 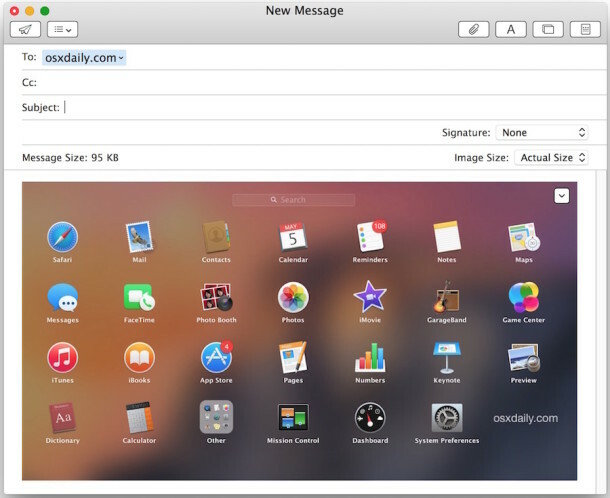 This is without a doubt probably the single fastest and easiest method of quickly emailing a photo or image from your Mac to someone else, but of course it requires that you have Mail app set up to use in OS X. If you are dragging and dropping multiple picture files, you’ll find this actually works with multiple images and any other attachment file types too. Basically, if you can drag it from the Finder to Mail.app it will probably attach and be able to send! Since I registered for Mac OS X daily news, I am pleased to register my appreciation, because I learned a lot from the news as well followed the step by step setting instruction on my Mac. My question is: How to set up Microsoft Office & Student for Mac 2011 on my Mac combine with Mail & Airmail apps on Mac OS X 10.9.4 ? I am having difficulty getting the best out of such combination.